The Agenda for our Crypto42 Token Investment Summit is online! …HEUREKA! Besides finding interesting speakers, persuade them to come to Vienna (not really the “big” Blockchain epicenter), establishing the agenda is the most challenging issue in setting up a big event. Actually, our goal is to do sort of an “expert’s day”, and update the participants with the latest developments in and around the “Token Universe”. Hence, it makes complete sense to conduct the event in close partnership with the new Institute for Cryptoeconomies headed by Alfred Taudes and Shermin Voshmgir. The institute, installed at the University of Economics in Vienna, is a great research platform for the Austrian and the European CryptoEconomy. 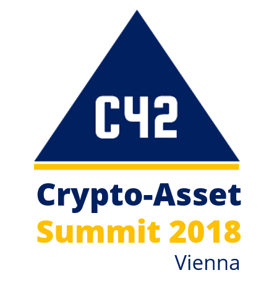 The agenda of our Crypto42 summit in Vienna is focused on Crypto-Assets and Crypto-Investments. It’s time to summerize and discuss those topics on the basis of the first two years of crypto-investments. There are so many things going on especially in the crypto-asset scene, that we probably could do a 24 hours agenda . Thus we tried to figure out the most relevant developments and to find the appropriate speakers to tell us about their views on what is next in the cryptosphere. The SEC Chairman made it quite clear— U.S. securities laws apply to the vast majority of ICOs. Companies raising funds with via ICOs must comply with the regulatory framework or will face possible enforcement actions by the SEC. This warning comes after ICOs raised more than $8 billion to date, which is in large part what has drawn SEC scrutiny. The SEC and the FINCEN are definitly going after the startups and the promoters (lawyers and so-called advisors) as well as after the cryptoexchanges acting without appropriate licensing. Eventually also the different European regulators have gathered momentum by addressing the different token types and the related and required regulation. So we asked lawyers from Germany, Switzerland and Gibraltar to tell us details about the approach of their regulatory authorities and to give us their two cents on the further developments. In a panel discussion we try to figure out how a ICO 2.0 regulation and how the related cryptocurrency exchanges could look like on an european and global basis. In 2017 we have not only experienced an ICO tsunami but also a wave of crypto-investment schemes such as Crypto-Mining-MLMs or Crypto-Trading-MLMs. Many of these investment schemes have to be regarded as scams, ponzi schemes or pyramid systems with the goal to steal investors’ money with fake mining farms or fake trading activities. One of the most prominent schemes is Optioment (read Fortune article here) were more than 10,000 investors have lost more than EUR 100 million. Hence, one important part of our regulatory session will be the talk of Dr. Ronald Frankl, lawyer with the Vienna law firm Lansky, Ganzger and Partner. The law firm just filed criminal charges against 6 people allegedly involved in the Optioment scheme. He is supposed to talk about his concerns regarding the cryptocurrency MLMs concepts and ICO-scams going on. The EU authorities are always slower compared to the US but nevertheless the EC commission IS moving: The Commission has already created an EU Blockchain Observatory and Forum which is working on a comprehensive strategy on distributed ledger technology and blockchain addressing all sectors of the economy. With an official statement issued as of March 8th, 2018, the European Commission made a definite commitment to create a Capital Markets Union (CMU) and a true single market for consumer financial services. As Peteris Zilgalvis, the one in charge of the EU Blockchain Observatory and Forum, is joining our event he will tell us about their thoughts and how they want to proceed. The sessions in the afternoon mainly will be concerned with all other issues which also have to be addressed asap in the cryptoecosphere: token valuation, token design, #crypto accounting, #crypto taxation. Discussions in all these topics just started and are mainly done by a handful people but is urgently needed. Assurance in all these topics is necessary to enable institutional money to flow into CryptoAssets. In a separate session we will talk about the future of VC´s in the dawn of the blockchain technology: thereby learning about crypto hedge funds as well as about virtual currency funds exclusively investing in tokens! We promise a great event and hopefully will see a lot of people interested in the same topics as we are. Please refer to our event’s website www.crypto42summit.com for the detailed agenda and the tickets. We are looking forward to see you then at the Crypto42 summit on April 16, 2018.